Allocate depreciation expense to, say, Regions based upon assigned percentages %, sales volume $, employee count or other user defined method. Download the free demo right now. If 5 branches, each receives 1/5 of monthly depreciation expense. • Select totals by Asset Accounts. 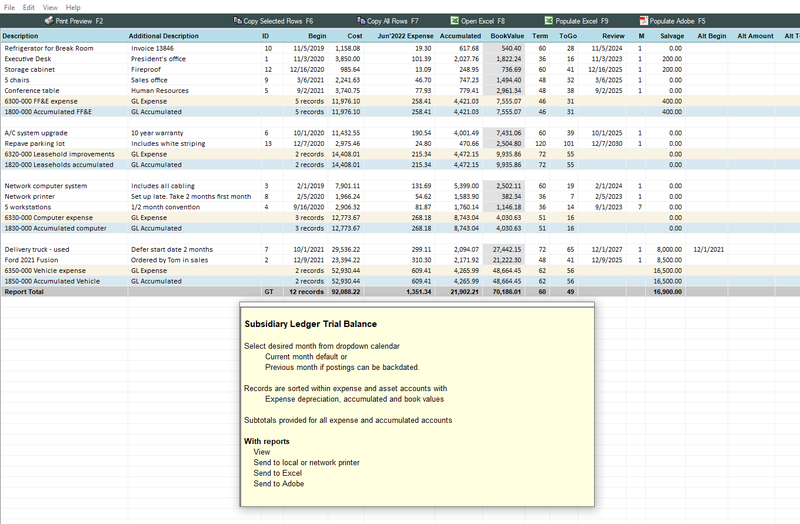 • Each Asset Account Total on the report should tie to the general ledger. Generate an depreciation report as of any month. • Sort records by Asset account. • Obtain Book Value subtotals for each Asset account. • Depreciation expense, book values and totals. Any month. Any year. Any period. The software can depreciate costs from original dates. Begin depreciating from an "as of" date. View an instant depreciation schedule verifying what was entered. Import to the software at any time for monthly depreciation and reporting. "Thanks. Your customer service is fantastic! Have a great week." Why others chose our software .... .
- MySubtotals report. Filter and group by selected fields on the fly. - MyReports. 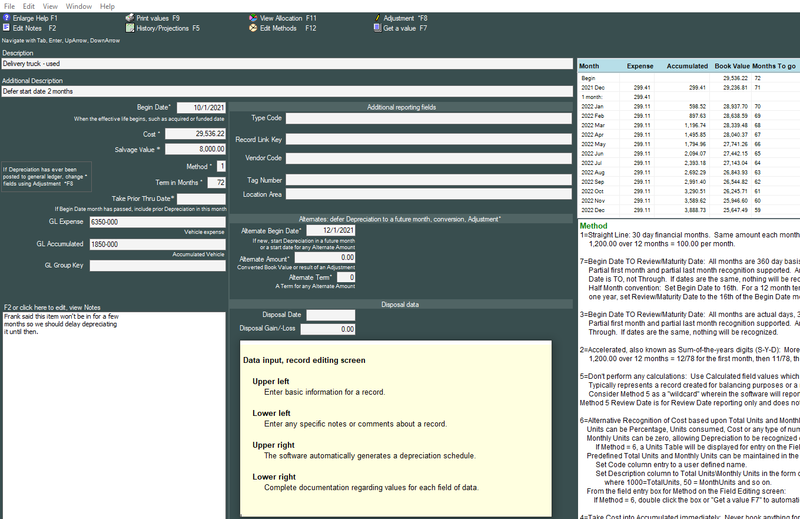 Create and retain your own commonly used reports. - View, print, export these reports, too. Monthly depreciation expense for a record can be distributed to multiple expense accounts. Lifetime depreciation schedules - past and projected - along with critical memo Notes. Reconcile your depreciation asset accounts. In seconds! 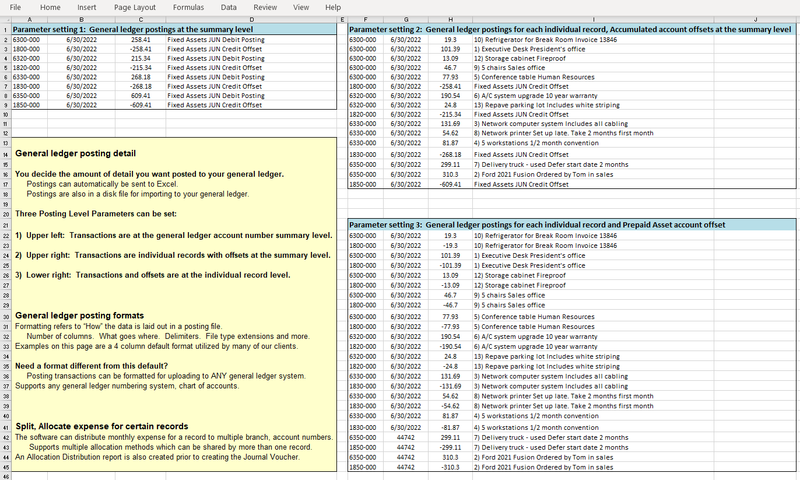 Reconcile an entire year - great when auditors want to see annual changes to your asset accounts. • MOST entered their records to the software database. • SOME imported their records to the software database from Excel. • SOME always import all of their Excel records for reporting, depreciation and general ledger processing. 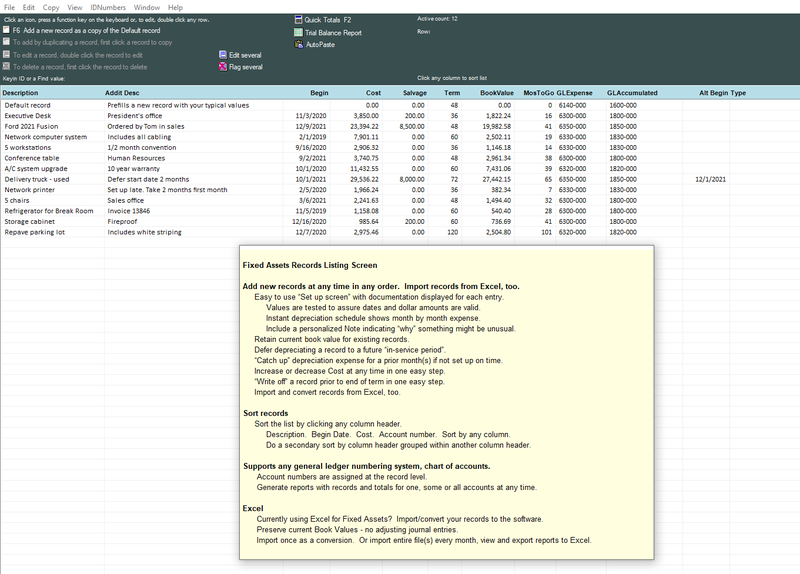 Excel worksheets created at branch sites. • ALL were able to maintain current balances and were up and running in a short period of time. • Stand alone and network sharing prices. • Evaluate the software with a free demo. 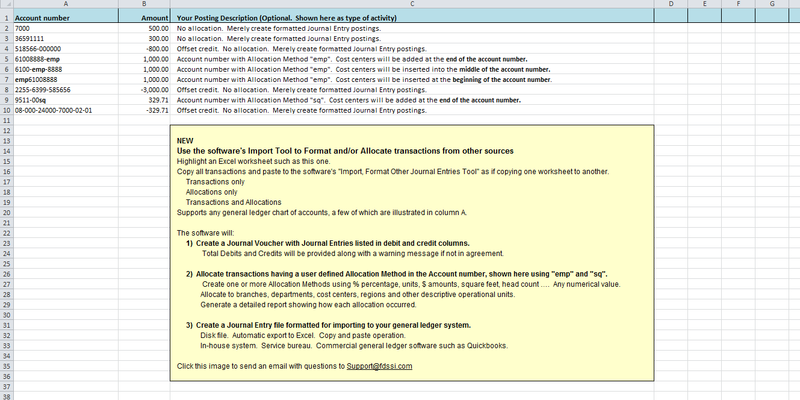 • Export records and reports to a worksheet. • Import records from Excel, too. • Immediate depreciation schedule helps verify correct entry. - Defer - Postpone depreciation to a future "in service" month. - Catch up - Include prior month(s) depreciation expense in current month when setup was late. - Adjustment - Single step adjustment screen simplifies partial refund, additional payment, change to remaining term or immediate write off. • Trial balance subsidiary listing with general ledger account reconciliation totals. 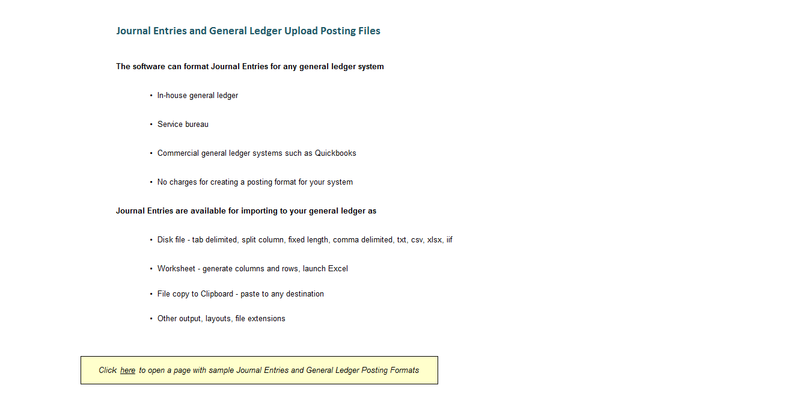 • Journal voucher posting source document with expense debit and credit offset columns. - Administrative and management reports, filters, sorting, detail and subtotals only level - view, print, export in seconds. 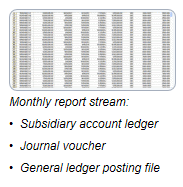 - Recall - Generate any report for a prior month, prior year with the History archive feature. Never lose a report again. - Supports any chart of accounts. - Depreciation terms can be from 1 to 999 months. - Calculate expense Depreciation, with ending book values, for a future month, quarter, year. - User defined sorting and subtotal categories. net activity. Pinpoint any out-of-balance conditions. Audit schedule preparation. Provide detail activity from one fiscal period to the next. Preserve current Book Value and Accumulated. All months have 30 days. Depreciate an item evenly over 1 thru 999 months. Depreciate an item for the actual date to date "in-service" days. Increase or decrease the amount being depreciated? Add a record that shouldn't begin depreciating right away? An alternate begin date defers depreciating to a future "in service" month. Generally, monthly depreciation is posted directly to a general ledger expense account. Evaluate the software on your office or home computer.